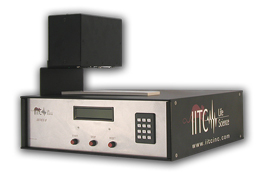 The IITC Tail Flick Test apparatus meter measures latency and/or temperature threshold when detecting properties of narcotic and strong non-narcotic drugs on mice and rats. A built-in Timer is automatically stopped when the animals’ tail flicks out of the beam of light, test result will be displayed on readout for viewing. An overhead halogen light source is in a constant “ON” (idle state). 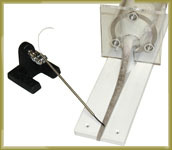 A pre-focused heat source supplies an area of 4X6mm stimulation to the tail. A built-in sensor in the tail groove detects the tail flick of the animal. The tail groove is a non-metallic material to avoid unnecessary conditioning of your animals; unlike other systems. If the animal does not flick their tail within the pre programmed cut-off time; the heat source shuts off automatically; avoiding tissue damage. Built-in timer displays the reaction time in 0.01 second increments. Control of system can be from either the front panel or supplied footswitch: Start, Stop and Reset of tests. Measurement of tail temperature at all times. Trigger temperature is automatic at start of every test. Warms tail to preset temperature (set by user) and then tests start, allowing all tail temperatures to be identical. This optional feature allows automatic preheating of the tail up to 75 degrees c., ensuring all experiment protocols to be precisely controlled and repeated. Once a preset temperature is reached, the test and timer start automatically. Once the animal reacts via tail flick the timer and heat source stop and test results are displayed. Readout will now show in repeatable sequence, start , end temperatures and test time. This unique feature stores the set temperature unless otherwise changed; eliminating temperature variations from test to test. We recommend that animals be restrained with one of the IITC restrainers. This unit solves the problem associated with “tail temperature prior to and at the end of testing.” See article: KJELL HOLE AND ARNE TJOLSEN: The Tail-Flick Formalin Test in Rodents: Changes in Skin Temperature as a Confounding Factor. Pain 53 (1993) pages. 247-254 Elsevier). Adjustable heat intensity in 1% increments room temperature to 250 degrees C.